I wish you could have joined me and these dear ladies (and Pam who took the picture so she didn't have to be in it!) on Friday at my house. We had such a good time. 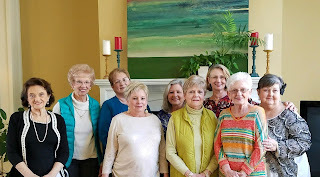 This group is growing out of a Bible study I do on Ruth using my book "Postcards from the Widows' Path." After we did it last year at my church the ladies continued to meet about once a month for lunch. 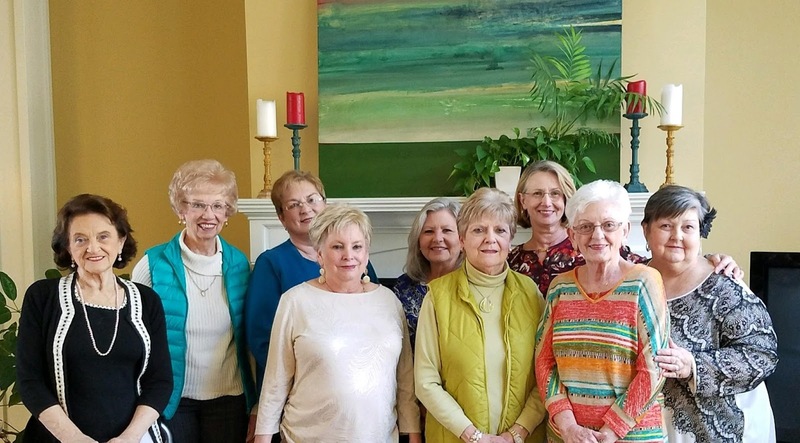 At the tea party on Friday they welcomed the women who were from this year's Bible study plus two new guests. Next month the widows are meeting for supper at a BBQ restaurant. I hope to have them back to my place again, maybe for a picnic carry-in where everyone will bring something. For this month's tea party Pam brought desserts (she makes the best! ), and I provided quiches, fruit salad and scones. What are your favorite menus or ideas for a widows luncheon or tea party get together? Let's hear about them!